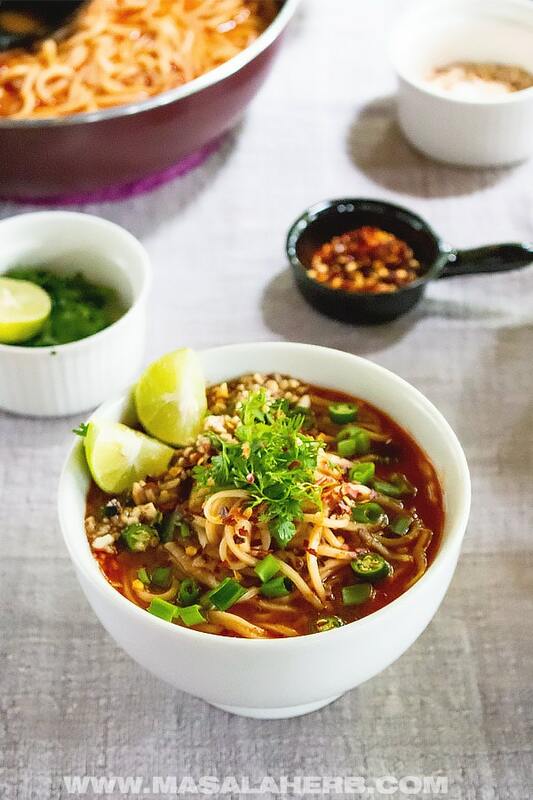 Spicy Thai Noodle Soup Recipe with red curry paste is stuffed with whole ingredients. This soup brightens up, is filling, it’s a one-pot wonder and full of gorgeous flavors. This spicy soup is for you if you enjoy spicy flavorful coconut soups such as the Thai Tom Kha Gai soup or if you are into deep complex Asian food flavors. This Thai noodle soup is not a traditional Thai dish but rather a Thai influenced soup which includes typical Thai flavors. Basically, the soup flavor profile resembles Thai curries prepared with Thai red curry paste. 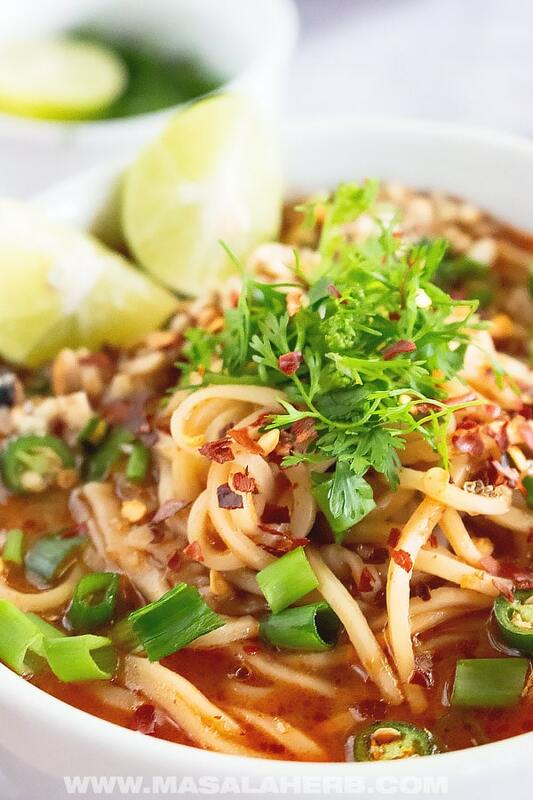 This Spicy Thai noodle soup comes together really fast and includes fresh raw ingredients. Besides you can adjust the ingredients you add when it’s time to enjoy the soup. The soup is Meatless, Vegetarian, Gluten-free, Lactose-free and can be turned Vegan if you use non-egg noodles. You can also prepare this spicy Thai noodle soup with chicken or shrimps/prawns too. In that case, add the cut meat /seafood to the pot after having stir-fried the red curry paste and cook it then through. The Thai red curry paste is a major ingredient in this soup, as well as ginger and garlic finely chopped or in paste form. The coconut milk and broth make up the soup, while the fish sauce and brown sugar add more flavor depths and a Thai touch to the soup. Use Asian chow/low mein noodles in this soup, not Italian spaghetti, because they taste differently. I prefer the soup with egg noodles but you are free to try this soup with rice noodles too. Fresh spring onions and cabbage are added fresh and raw to the bowl with the soup and noodles. 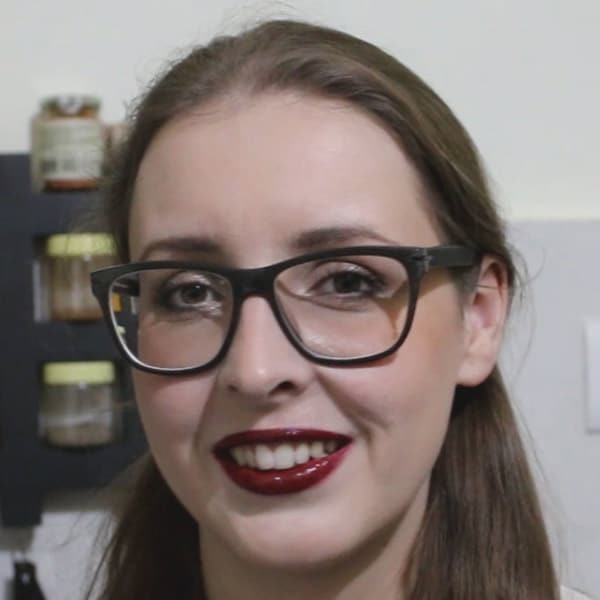 You can also add sprouted lentils, avocado or some chopped banana flowers if you feel adventurous. For the garnish, you can choose to add a combination of red chili flakes, cut green chilis, cilantro, crushed peanuts, cut green spring onion stalks and a drizzle of Lime Juice. All these ingredients turn the Thai noodle soup spicy with a touch of sweet, salty and sour. 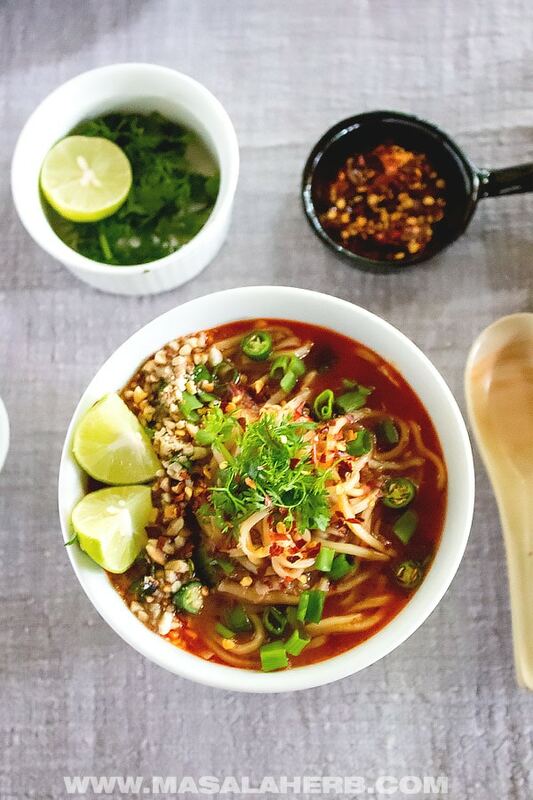 How to make this Thai Noodle Soup? The Thai Noodle Soup is a quick and easy One-Pot soup. That is because the base of the soup cooks quickly with the red curry paste and noodles. The Veggies are added raw into a soup bowl, which saves cooking time. That way you can add as much cut spring onion and cabbage as you like and because the fresh ingredients are raw, you are bound to have a nutrient rich soup for dinner. 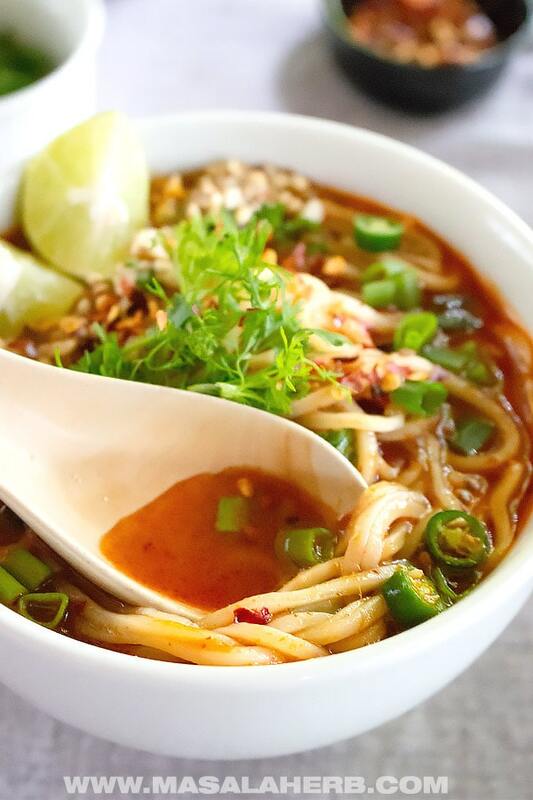 Spicy hot, sweet, salty, sour Thai Noodle Soup with fresh raw nutrient-rich ingredients. Gorgeous one-pot quick and easy meal idea which you can adjust to your liking. Ready within 20 mins! Heat up a pan and add the oil. Add in the ginger and garlic and stir-fry a little bit on a higher flame. Next, add the red curry paste and stir-fry for 2 minutes on high heat. Reduce heat, then pour in the coconut milk and follow suit with the broth. Season with fish sauce and the brown sugar. Mix the contents. Add the Noodles to the soup. Cook the noodles soft on medium heat. Then add the cooked noodles over the raw veggies and pour the soup over everything. Garnish with the lime juice, red chili flakes, fresh green chilis, crushed peanuts, fresh cilantro to your liking. You can also add fresh avocado cut, sprouted lentils or even banana blossoms cut to the soup with the cabbage and spring onion. Adjust the garnish to your liking, If you don't like heat, reduce or omit the chili flakes and green chili. Dear Reader, how often do you prepare Asian inspired meal at home? As the weather begins to turn cold, I’m always on the lookout for delicious soup recipes! This might just become a new favorite! I absolutely love Thai food and even more, I love Thai recipes I can easily make at home and this one was so tasty! Love this recipe! So fresh, bright, and full of flavor! This recipe is so easy and I love the flavoring! Will definitely be making it again! 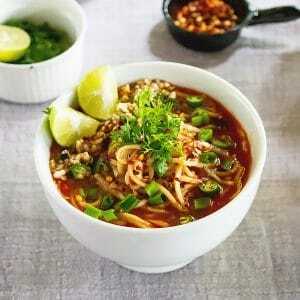 Hi, this may be interesting you: Spicy Thai Noodle Soup Recipe!